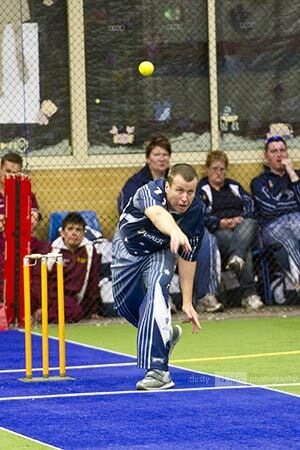 The secret to being a successful indoor cricket bowler? No, it's not Testosterone . . . Despite all the hype, the main aim of a good indoor cricket bowler is not knocking the batsman's head off or breaking his / her ribs. It's actually a little more nuanced than that . . . The basic strategy when bowling is to prevent the batswoman from scoring. Failing that, it is to stop her from scoring 2's. At the same time, the bowler is trying to force the batswoman to play the sort of shot which will increase the chances of her being run out - run-outs are by far the most common form of dismissal in indoor cricket. Catches are the next most common. Clean-bowled is the least common. To prevent the batswoman from scoring, or from scoring 2's, the bowler should be bowling within that old maxim, "line and length". The line (direction of the delivery) and length should be such that the batswoman doesn't have the room to play the standard "down and up" shot so successful in indoor cricket (see above). The better bowlers try to hit the batswoman on the leading leg, at or a little above knee-height. This makes it almost impossible to play down and up to the off side, and very difficult and risky to try to play the same shot to the on side. It also make the ball very difficult to drive firmly. Quicker bowlers, or those who move the ball off the pitch, would be aiming to hit the batswoman's leading leg a bit higher, more around the hip. The result of such a ball is very often a ball played not too firmly to one of the in-close fielders. This in turn greatly increases the chances of a run-out, either as a result of the fielder tapping the ball straight back to the wicketkeeper, or taking it and throwing to the other end (remember, most batswomen will run whenever there is contact with the ball, so the chance of run-outs in this fashion can come around very frequently - if the bowler is doing the right thing). By bowling this line, even an over-pitched ball becomes less damaging to the fielding side. An over-pitched ball in line with the front leg will almost certainly be driven to the ON side. The very worst result would be 4 scored. But if it is lofted at all, it becomes a chance for one of the back-half fielders to catch. On the other hand, an over-pitched ball on or just outside OFF stump stands far more chance of being hit directly to the back net, for a total score of 7, and no chance of being caught (hits direct to the back net are not out if caught off the net), whereas an over-pitched ball on or just outside LEG stump has less chance of being hit directly to the back net and more chance of being hit off the side net and caught. The most common mistaken belief about bowling in indoor cricket, especially from Testosterone-soaked young males, is that faster is better. Well, if you are genuinely quick (and that means very, very, very quick), your pace alone can be enough to get you results. But for 99.999% of those who play, line and length are paramount. Bowlers of spin, leg-spin in particular, will sometimes bowl a different line to the above, especially if they believe they can get a particular batswoman out stumped or caught. But they too are generally best served by trying to hit the batswoman on or around the knee of the leading leg.